New Condition | Hard Bound w/dc | 192 pp | Size: 7.7" x 11.5"
Though now out of print and hard to find, this book is such a great resource guide that we vowed to carry it as long as we can. You'll love the step-by-step instructions and many helpful photos, showing you how to make and administer 250 effective and safe home remedies using infusions, decoctions, tinctures, ointments, salves, syrups, infused oils, powders for capsules, compresses and creams. 125 different plants are covered from A-Z revealing the parts used and applications of each. There are 16 extensive charts on the therapeutic applications for specific ailments along with a case history example. 600 full-color illustrations and photos throughout. 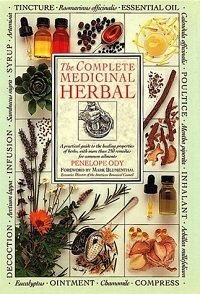 A must-have for herbalists and anyone interested in alternative plant medicine.